"Miscellaneous Record - Jackie "Jack" Leroy Hill"
"Transcript of the above Newspaper Article"
Army Pvt. 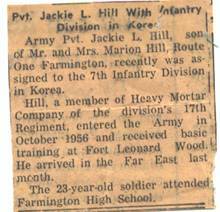 Jackie L. Hill, son of Mr. and Mrs. Marion Mill, Route One Farmington, recently was assigned to the 7th Infantry Division in Korea. Hill, a member of Heavy Mortar Company of the division's 17th Regiment, entered the Army in October 1956 and received basic training at Fort Leonard Wood. He arrived in the Far East last month. The 23-year-old soldier attended Farmington High School.